Arrowbot the hunter-gatherer robot loves to read and learn about dinosaurs. Right now he’s reading in Rick’s Library. George and Tessa walk in, just home from school. Is that the one with all the cool coloring pages and activities in it? Yep. Right now I’m reading about an ancient prehistoric reptile called the Plesiosaurus. Here, Tess, let me tear out this Plesiosaurus coloring page for you. Plesiosaurus. Hm. I’ve never heard of that dinosaur. Wrong. Plesiosaurus wasn’t a dinosaur, George. It was a reptile. All dinosaurs lived on land. Remember that time we cloned mini-T.rexes, by combining Tyrannosaurus DNA with canary DNA using CRISPR? That was epic! An epic disaster, you mean. They became an invasive species after they bred with Mrs. Amergris’s parrot. Hihi, the look on that woman’s face when I told her her parrot had eloped with a dinosaur. Good times. But our cloning and splicing days are over, sadly. What do you – What have you got going on in that lab of yours? So, back to Plesiosaurs. They’re were a lot like Nessie, weren’t they? You know, the Lochness Monster. Uh-huh. Many people think that the Lochness Monster is a surviving Plesiosaurus, but it’s probably not true. Not yet, anyway. I wonder if the Natural History Museum has any Plesiosaurus fossils I can borrow. Don’t worry, Arrowbot, don’t worry. Just…enjoy your Plesiosaurus book. Hey, Tess, wanna go with me to Scotland? Okay! 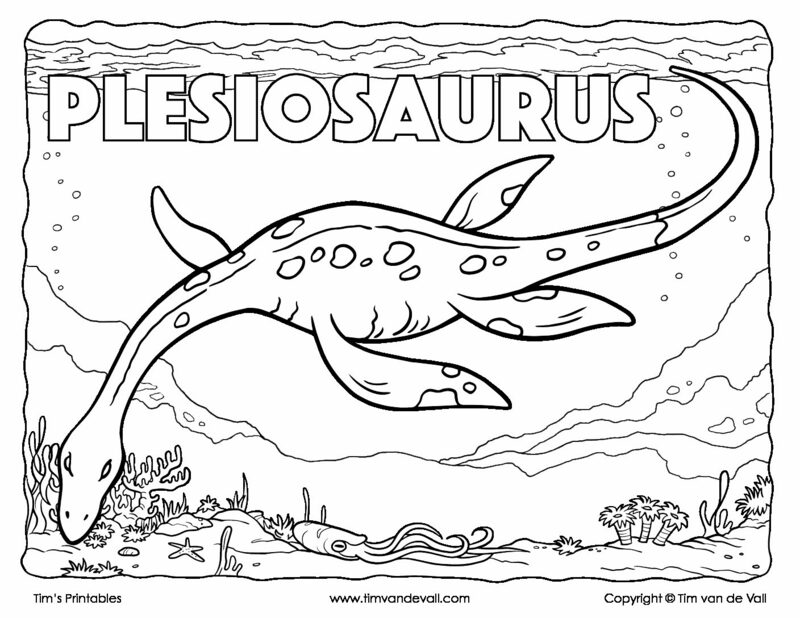 But first, take a look at my finished Plesiosaurus coloring page. Nice work, Tess! You can hang it up next to your collection of abstract ducks. I can’t believe the modern art gallery rejected my ducks. Stupid modern artists.